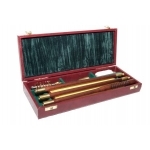 Wooden two-piece rod with split jag, wool mop, phosphor-bronze brush, oil and cloth presneted in a smart box. For use with 12g, 20g, 28g and .410 shotguns. UK threads .. 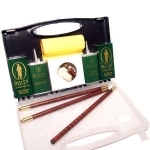 Plastic carrying case containing three-piece wooden rod, split jag, wool mop, phosphor-bronze brush, Gun Oil, Barrel Cleaner, CCL Stock Conditioning Oil and cloth. For use with 12g and 20g shotguns. UK thread size. 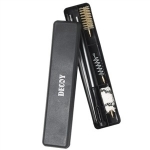 Available in 12g or 20g ..
Decoy Shotgun cleaning kit comes with a rod and a wire cleaning brush and two soft pull throughs, presented in plastic box. 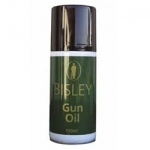 Available in Cal.12, Cal.16 or Cal.20 ..
Bisley Gun Oil is a high quality, light viscosity mineral oil especially formulated for quality sporting guns. It's unique rust inhibitor prevents corrosion and rusting for prolonged reliable performance. 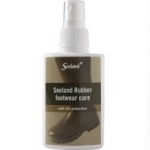 It is a specially formulated to ensure fas..
Seeland Rubber Footwear Care ..
Deluxe Burgundy leather box. 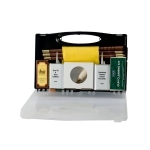 Contains three piece deluxe rod, Express oil, 009 oil, phosphor bronze brush, wool mop, brass jag, nyon brush & yellow duster. Available for 12g, 16g, 20g & 28g. 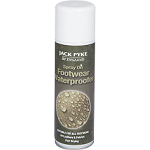 ..
"Nano" Technology waterproofing, stain resistant, quick drying and suitable for all footwear. No efect to colour or feel of material, can be used on fabrics or leather 300ml .. 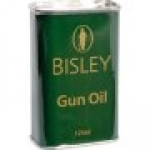 The Presentation Kit from Bisley is contained in a durable presentation case. 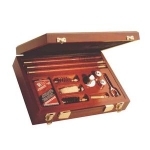 Includes three piece rod, phosphor bronze brush, wool mop, nylon jag, yellow duster, Bisley Gun Oil, Bisley Bore Cleaner & patches - Perfect for day's in the field a..
Deluxe Burgundy leatheret box. 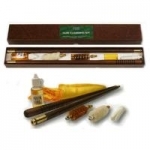 Contains three piece deluxe rod, phosphor bronze brush, wool mop, brass jag & yellow duster. ..
Parker-Hale PS2 Shotgun Cleaning Kit Deluxe 3 Piece Rod • Nickel Oil Bottle, Snap Caps and Extractor • Youngs Oil • Bronze Bristle Brush • Wool Mop • Brass Jag •Layered Wooden Presentaion Box ..